Siri is getting more and more useful, and one of the better uses for Siri are location based reminders. With location reminders, you can have Siri remind you to do things like make copies when you get to work, feed the cat when you get home, and just about any other task that would be helpful to be reminded of upon arrival or departure. This tends to work best with iPhone, but it works with iPad too as long as Siri is enabled. For Siri to adequately serve you location based reminders, you will need to have locations defined for yourself for places like Home, Work, School, etc, and addresses set for contacts. Don’t worry, if Siri doesn’t know the address for a contact or common place, you will be asked to provide one. You will also need to have Location Services turned ON for Reminders and Siri. This can be done through Settings > Privacy > Location Services. For the last example, you do not need to specify a location because Siri will assume you mean leaving your current location as determined by GPS or internet. The reminder will therefore appear whenever you depart the current location, regardless of where or what it is. As mentioned before, if Siri does not know the address for a location you request or a contact you mention, you will be asked to provide one by adjusting that contacts details. Though Siri is still in beta, Siri is undoubtedly becoming more and more useful, and if you aren’t using it yet to perform common tasks you should start doing so now, intelligent assistants will only be getting better. Oh and finally, if you don’t have Siri, remember that Mac users can also set Location Reminders with OS X 10.8 and later, though they are dependent on internet access in order to know where you are. If you do have a Mac and an iOS device with Siri though, any created reminder will sync across everything as long as the same iCloud account is used on each device. 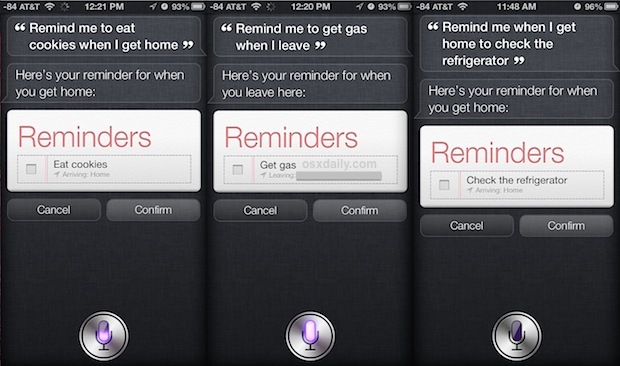 This is the only way I even use the Reminders app and service, it may be the best use of Siri out there! Though location based reminders are useful, turning on Location Services for Reminders will drain your battery extremely fast. It pings your location quite frequently. But, when needed, you can’t beat it. Hmm, trying this after I allow settings, I get the message “Your calendar service, which keeps track of your reminders, doesn’t allow location-based reminders.” As far as I know, the Exchange-served calendar is active on my company iPhone 5. Any ideas if Outlook has some sort of issue with this type of reminder? Time-based reminders work fine. Have you tried it again recently? I was getting the same message for a couple of days but a few days after that, when I tried it again, it worked like a charm. Of course it started working when I was demonstrating to our IT person that it would not work. Murphy’s Law. I am having same problem,any sure cures? I cannot get location based reminders to work with Siri. I say ‘Remind me to walk the dog when I get home’, siri says ‘ok i’ll remind you, when would you like me to remind you, I can remind you at a time or a place such as home, work, gym’, so I say ‘when I get home’ (which it shows it has heard correctly’ so it repeats ‘ok i’ll remind you, when would you like me to remind you, I can remind you at a time or a place such as home, work, gym’ and so begins the infinite loop (until I give up). Home and work addresses are definitely set properly in my ‘me’ card. Jon … I found that Siri acts as you describe when my tried jailbraking my iPhone 5. But when I restored it back to default firmware, it started working normal again. If you are no jailbroken, perhaps a restore of the firmware may fix the issue.